Every once in a while this blog deviates from the analysis of a particular match's trends and incidents, focussing on a specific play or pattern from a specific team. Today we will be dissecting Gonzalo Higuaín and Mezut Özil's typical move during the match that pitted Real Madrid against Borussia Dortmund for the Champions League's semi-finals. As mentioned earlier, Higuaín is often keen on leading defenders (especially direct markers) astray, clearing up space for his team-mates' penetrations through the middle. 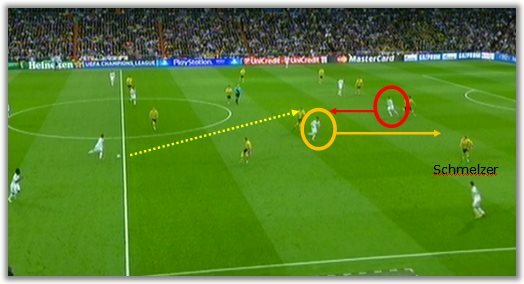 In this particular instance, it is Özil who profits from the striker's clever move. In the first picture, Modric is shufflling the ball from one side to another, looking for the best passing option. Dortmund are apparently well positioned, with bender picking up Özil (orange) and Hummels doing the same on Higuaín (red). When Higuaín sees the Croat midfielder under no pressure, he immediately checks towards the ball, Mats Hummels marking him all the way up. Bender is under the impression that Hummels is free to pick up Özil and leaves him unmarked, with Schmelzer too far wide, ready to press Di María should he get the ball. What happens next leaves a gaping hole right in the centre of Dortmund's defence. Hummels is dragged out of position by Higuaín, a move that is not duly compensated by either Schmelzer - who remains wide - or Bender - who keeps his position in midfield (most likely because that is not the way Jürgen Klopp instructs his men). Despite Higuaín's expertly taken first-touch pass to play Özil in, the Turkish wizard is unable to put the ball in the back of the net, wasting a precious chance in the 13th minute. You can watch the whole play below and see how a three-man move can pick a well-organised defence apart.